Delhi's top attractions are dominated by ancient monuments, mosques, and forts. No doubt, places such as Qutub Minar and India Gate are mesmerizing, must-visit places. But once you've seen the tried-and-true in India's capital city, what's next? Here are some offbeat things to do in Delhi. Do you have kids in tow? There are many fun things to do with kids in Delhi, even if you’re only spending 48 hours or as long as one week. Khari Baoli Road, next to Fatehpuri Masjid at the western end of Chandni Chowk in Old Delhi, is home to the largest wholesale spice market in Asia. Spices connected India to the West, and the market at Khari Baoli Road has been in business since the 17th century. However, Gadodia Market (which is on the south side of Khari Baoli and is where many of the spice shops are) was built in the 1920s by a wealthy local merchant. You'll get to see huge sacks of spices being transported and sold. As fascinating as it is, the spice market is also super congested, and you're likely to feel overwhelmed trying to navigate through its interior alleyways by yourself. If you think the mayhem could be a concern, it's a good idea to see the market on the Old Delhi Spice Market and Sikh Temple tour. Do note that the market is closed on Sundays. Old Delhi and Chandni Chowk are usually associated with crowds and chaos. However, located just off Kinari Bazar, you'll find a tranquil lane with nine colorfully painted Jain havelis (mansions) that were built in the 18th century. This little hamlet is complete with an exquisitely carved white marble Jain temple at the end of the lane. Its interiors have some magnificent murals and paintings. Do note that leather and photography aren't permitted inside. A towering 108-foot-tall landmark statue of powerful monkey god Lord Hanuman rises above the railway tracks at Karol Bagh, to the northeast of Connaught Place in Delhi. Completed in 1997, it has become a symbol of the contrast between traditional and contemporary Delhi, with the gleaming new Metro train zipping past. 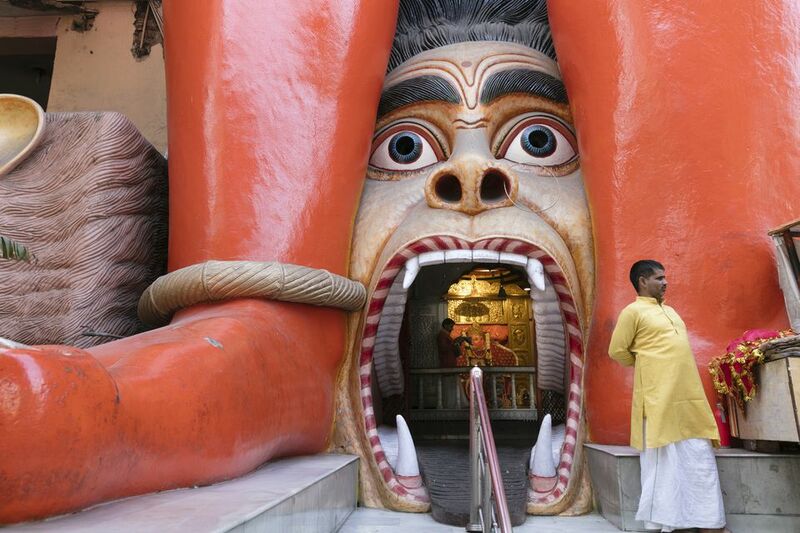 The statue is part of a Hanuman temple (Sankat Mochan Dham) at its base, which is entered by stepping through a cavernous carved mouth of a demon slain by the god. This is believed to ward off bad luck. Tuesdays and Saturdays attract the most devotees, particularly for the evening aarti (prayer ceremony), during which the arms of the statue move back and its chest opens to reveal images of Lord Ram and Sita. This mechanical show also takes place in the morning on both days. The temple is located close to Jhandewalan Metro Station on the Blue Line. Nizamuddin Dargah, the resting place of one of the world's most famous Sufi saints, Nizamuddin Auliya, attracts Sufi devotees from around the globe. On Thursday evenings, its courtyard erupts with the soulful sound of live qawwalis (Sufi devotional songs) accompanied by traditional Indian instruments, which serenade the audience into a trance. One of the families that perform the qawwalis has been singing there for hundreds of years. Nizamuddin Dargah is located in the Nizamuddin West neighborhood of New Delhi, surrounded by a bustling market and near Humayun’s Tomb. Get there just before sunset. Prepare to walk through alleyways and face large crowds, and touts and beggars if you're a foreigner. Do dress conservatively, and you may wish to bring something to cover your head with (although it's not compulsory if you only enter the courtyard). You'll need to take off your shoes just before you go inside. Ignore the shopkeepers who will insist on minding them for a fee. Delhi by Foot conducts an excellent walking tour. Or, join the Hope Project for a walking tour of Nizamuddin Basti, an old Muslim Sufi village surrounding Nizammudin Dargah. India's first public open-air art gallery, the Lodhi Art District, is situated between Khanna Market and Meharchand Market in south Delhi's Lodhi Colony. International and local artists have painted more than 20 murals, facilitated by St+art India. This non-profit organization aims to make art accessible to a broader audience in public spaces. While you're there, grab a bite to eat at one of these trendy restaurants in Lodhi Colony. The Changing of Guard ceremony at Rashtrapati Bhavan is one of many similar celebrations that take place around the world (the most famous one is at London's Buckingham Palace). It remains a relatively unknown attraction in Delhi. Introduced in 2007, the ceremony was revamped and relocated in late 2012. It now happens on the forecourt of the presidential residence every Saturday morning, where there's space for 200 guests. An equestrian display by the president's bodyguard on horseback in their ceremonial regalia has also been added. Since access to Rashtrapati Bhavan is generally restricted, the ceremony provides a fantastic opportunity to see the architecture of this immense building, once the centerpiece of New Dehli. The starting time depending on the season. It starts at 8 a.m. on Saturdays from mid-March to mid-November and 10 a.m. from mid-November to mid-March. On Sundays, it starts at 5:30 p.m. from mid-March to mid-November and 4:30 from mid-November to mid-March. The cost is free for all. Enter through Gate 2 or 37, and bring photo identification. Meet like-minded travelers, discover new travel ideas, exchange travel stories, read and buy travel books, and use the free wireless Internet while you enjoy snacks (and pay only what you want for the coffee and biscuits). Regular interactive talks and workshops are also held by travelers, photographers, and writers. Musicians sometimes have casual jam sessions at Kunzum, too. Learn about the underbelly of Delhi on a guided walk through streets of Paharganj and the area around New Delhi Railway Station. Tours are led by children who once lived and worked on the streets themselves. This unique tour, recommended as one of the best walking tours in Delhi, aims to make the story of Delhi's street children heard and give a view of their world through their eyes. It's run by Salaam Baalak Trust, an organization that provides shelter, food, and support to the city's homeless street children. The tour is eye-opening, and sadly haunting and heartbreaking in parts, as you'll witness a brutal side of the city. However, it's also inspiring as it highlights how much the children can achieve if given the right opportunities. You'll even get to visit a Sikh temple's free langar community kitchen. Many people reside in sub-standard conditions in Delhi, and it's possible to go on a walking tour of a city slum to gain a greater understanding of how people live there. You'll get to visit a thriving small-scale industry, a temple, a family home, and a school. The tour is designed to be inspiring and educational, and a large percentage of the proceeds are used for the betterment of the community. It's definitely not the depressing poverty tourism you may expect. The little-known Crafts Museum is a relaxing place to wander around and see artisans demonstrate traditional embroidery, weaving, carving, and pottery. There are also galleries with more than 20,000 exhibits of handicrafts from all over India, a lovely cafe where you can dine, and stalls that sell products at reasonable prices. Notorious Tihar Jail in Janakpuri, West Delhi, has a couple of surprising attractions, namely a food court staffed by prisoners and a market that sells products made by them. The food court, started in 2014 to give the prisoners hospitality experience, was revamped in early 2017. Combine your visit with a trip to nearby Kumhar Gram, the largest pottery village in India. It's a good idea to go on a guided walking tour through the village, such as the one offered by SeekSherpa. Atmospheric Gurudwara Bangla Sahib, a prominent Sikh temple near Connaught Place, isn't just a great place to relax for a while. It has a huge kitchen where the langar (free food for anyone who wants it) is prepared. It's staffed mostly by volunteers, and you can go in and have a look around or even help out. About 10,000 meals are served per day, which requires a lot of cooking. For a different experience of Delhi, take to the streets on a bicycle and immerse yourself in the various colors, smells, sounds, and tastes. Delhi By Cycle, a company started by a journalist from the Netherlands (the Dutch are known for their love of riding bicycles), offers a range of bicycle tours in the city. These include tours through various parts of Old Delhi and New Delhi, so you can explore different corners of the city. You'll need to be up early though since many of the tours start at in the early morning to avoid the city's traffic. Have you seen India's eye-catching Bollywood dance moves and been transfixed by them? Delhi Dance Academy gives you the opportunity to learn them as well, at its fun two-hour namaste India dance workshop, especially for travelers. You'll be introduced to four Indian dance forms: Bollywood, Bhangra, Belly Dance, and Garba Dandiya (this Gujarati folk dance is commonly seen during the Navaratri Festival). The dancing is choreographed to popular songs and you'll get a two-minute video of your performance to take with you. Delhi's hipsters have a new hangout, which they'd probably like to keep to themselves as not many people know about it yet. Champa Gali is an up-and-coming bohemian street lined with cafes, design studios, and boutiques. It's situated in Saidulajab, an urban village close to Saket in south Delhi. Up until the 1990s, the neighborhood was nothing but agricultural fields. It was later populated with cow sheds and furniture shops but is now transforming into a contemporary and creative community, led by the street's retailers. Impromptu jam sessions and pop-up bazaars take place there. Find it at Khasra 258, Lane 3, Westend Marg, Saidulajab. In case you're wondering, the street gets its name from the champa (frangipani) plants that decorate it. Every Sunday afternoon, free traditional Indian wrestling known as kushti takes place at Meena Bazaar opposite the Red Fort (at the end of the park near the tomb of Maulana Azad). This style of wrestling blends a form of ancient Indian mud-fighting with Persian martial arts. Its popularity in India can be traced back to the 16th-century Mughal era. It was recently featured in the 2016 Bollywood movie Sultan, starring Salman Khan.